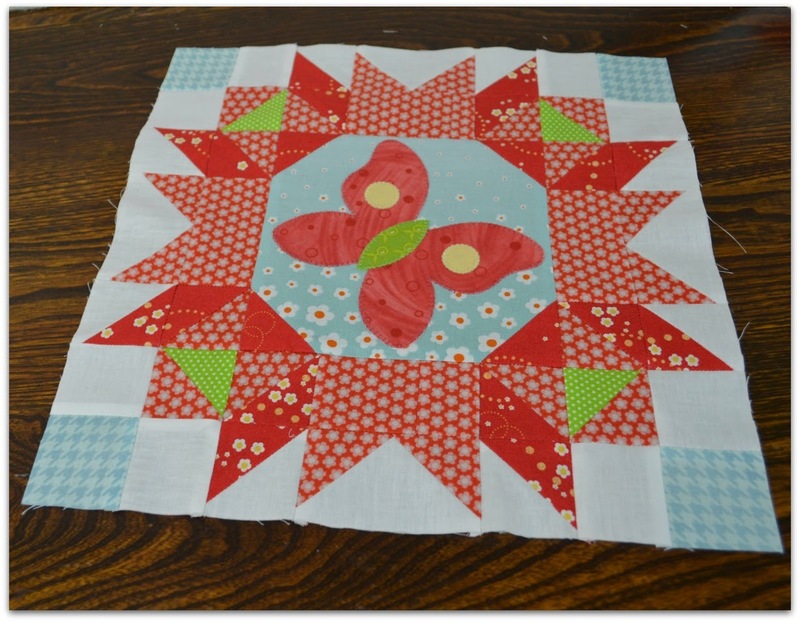 Here is my final installment on Jacquelynne Steves' free block of the month series. The quilt center is sewn, but it's still in an evolving and growing status as I decide on borders. 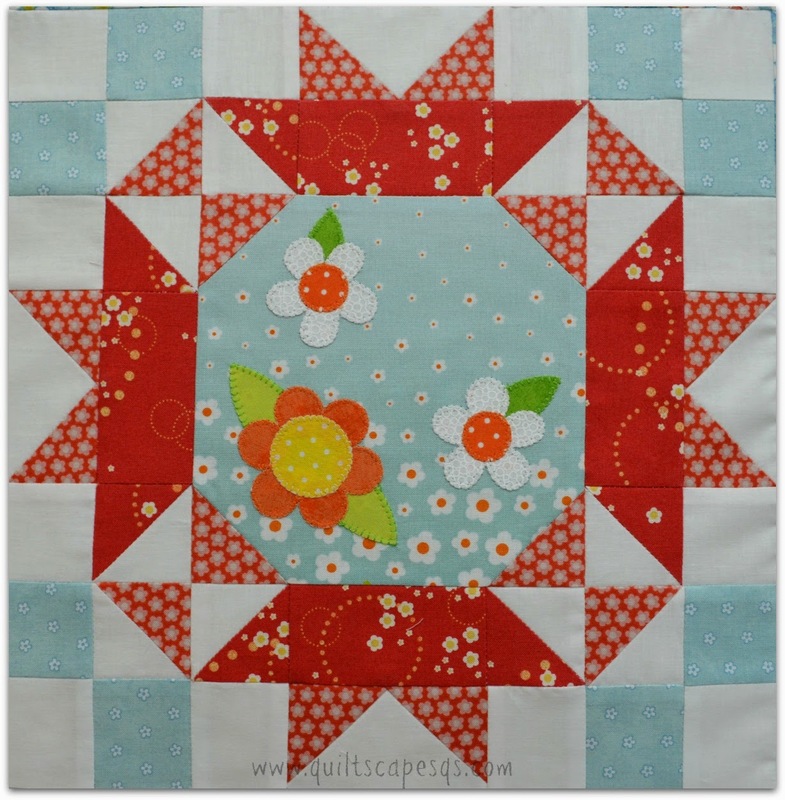 My goal with this quilt was to use ONE layer cake (Adornit Crazy for Daisies), then supplement with a white background and my own scraps. I also wanted to create each block with an emphasis on the star pattern using the reds in the layer cake. Another goal was to be able to use the AccuQuilt die-cutting system to prepare my applique' pieces. Then I made block #4 and the pattern was great, as usual, but I think I used too much red. So I bought a little more fabric and made another block using pattern #1. Then I made another Block #2 to balance things out. I cut 10" squares diagonally in half and paired them with 10" background squares cut the same way to make hourglass blocks, and trimmed them to size. Not my normal way of doing it, since it created all-bias edges, but with a little starch it will work, and was a great way to grow the quilt. Then I tried to put the quilt together. Oops. Good thing I recently watched this video so I knew how to use it!! Fixed the setting blocks and started to audition borders. Colors are great, but, really, it's so busy! Maybe I'll have to go with a plain border. Then I spied it - OH, NO! That center block is lying on it's side... urghghgh! Time to get "frog-stitching" again... "Rip-it, rip-it, rip-it". And of course, the bobbin ran out just as I was re-attaching it to the quilt center... sheesh. Whew! Now it's all put back together as you see in the first picture. I think it will make a great Spring wall hanging, or I could add a couple more borders for a baby quilt. Maybe more open space for quilting detail. I'll have to dream about it for a few more weeks while I learn to use my new longarm machine! Now for the giveaway info: Jacquelynne is giving away her fabulous digital e-book! Sew cute! In addition, I'll throw in a new seam ripper, my orphan block #4 as pictured above, plus a little stack of fabric. 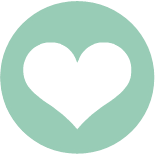 Leave a comment to tell us about your favorite quilting tool or gadget. Be sure to include your email address if you are a no-reply blogger. Giveaway will end next Monday (March 2nd). 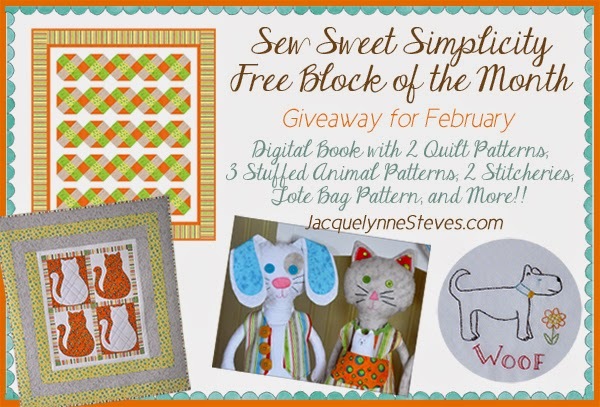 Jacquelynne also has a second special giveaway going on today, with more info on Thursday to kick off her 2015 free Block of the Month! 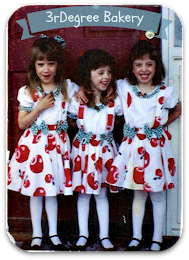 The free patterns for Sew Sweet Simplicity will only be available for the next month. See all Jacquelynne's details on her blog ↓↓. 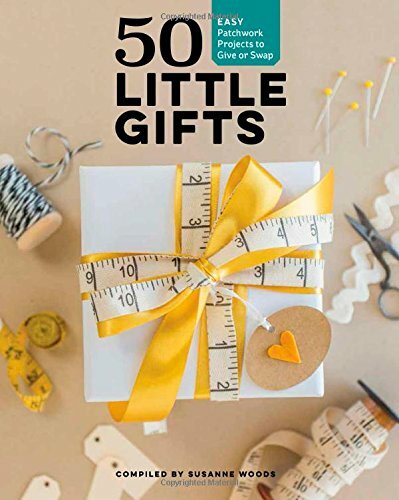 Be sure to stop by each of our Sew Sweet team for more inspiration and giveaways. Great quilt. I was surprised by the change in the direction of the side blocks made a big difference. Always learning. My favorite tool is my cutting glove, rotary cutters scare me and now I feel safe. LOL, I have a few "Rip-It Tools. I can unsew pretty fast with my Clover one. It's my favorite. Very sharp and a thin point to get tnto tight spaces. Glad you got your blocks done. I'm still choosing fabrics. It's on my February To-Do List. Gotta get down in the Quilt Zone and Get them DONE! I like the star setting idea. Baby quilt or wall hanging, it's good to have a few small quilts ready for giving. My favorite tool is the rotary cutter! Deonn, Your quilt is fabulous! I think it is perfect for some new baby! The mother would love that quilt! I have to say there are tons of favorite tools... but my all time MOST favorite is one that has saved my sanity many times and will continue to do so for as long as I can stand and quilt and that is the Dainty Ditcher by Sherry Rogers Harrison. 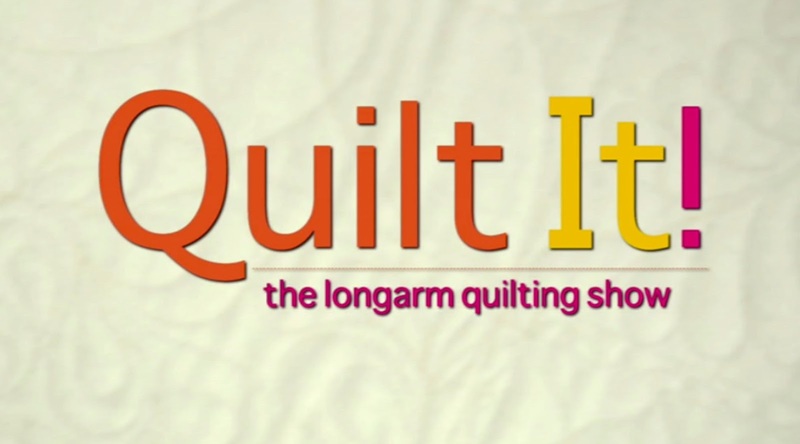 I use it when I longarm quilt for the public or myself. I just love your quilt! I have so many tools I would say are my favorite. But, if I had to pick one I could not live without, it would have to be my rotary cutter. Deonn- this is just simply a GORGEOUS quilt! I couldn't live without my seam ripper- I do a lot of "unsewing"!! I also love my QuiltCut2 cutting mat! 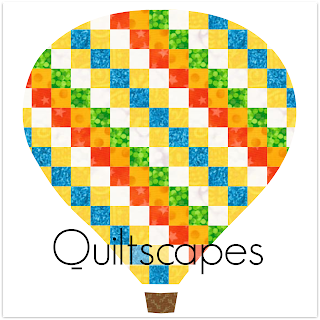 Love your setting and your quilt is so much fun. I'd love to win a copy of the book, and your nice extras! 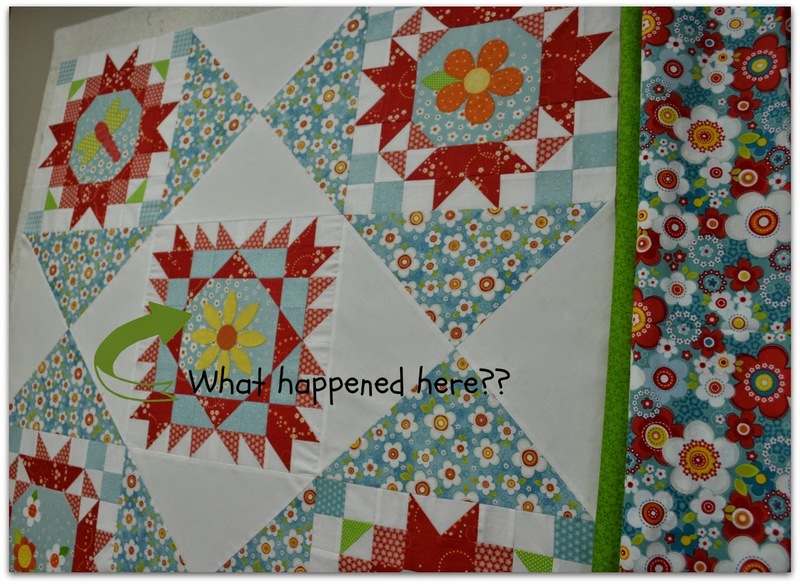 It was fun to see your blog and what you've done with the Sew Sweet Simplicity blocks. I've been a seamstress much longer than I've been a quilter, and quickly learned that, no matter how experienced you are, a good seam ripper is a must. I think I'd choose my gridded rulers as my must-have favorite tool. Without them, it is much more difficult to get accurate blocks, and cutting with a rotary cutter would be hard to do properly. Very pretty. I think there is nothing more frustrating than trying to reverse sew and move a center block. I hate when that happens. I have a top I'm doing that to right now. I myself am overly attached to using my seam ripper. I like your use of the red! I admire your perseverance! Your quilt is adorable, and the colors are so happy. I love it. Since I am unsure as to whether I am worst at cutting, piecing, ironing, or quilting, I guess I would have to say that my seam ripper is my best friend. 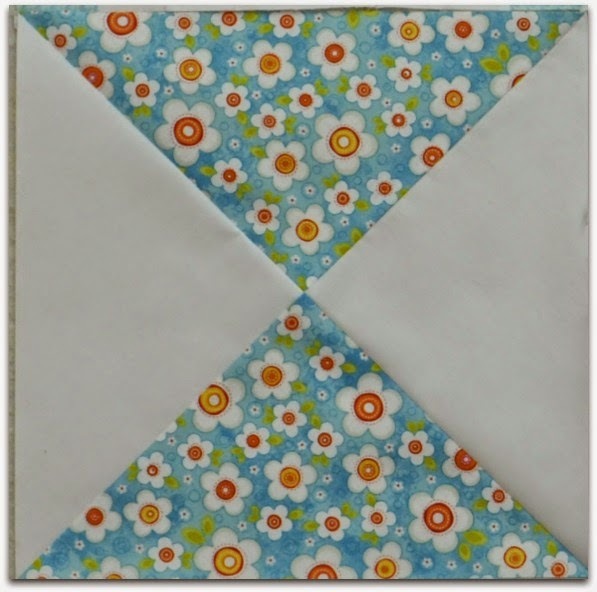 Deonn- I am a beginner quilter and soon I found out that I couldn't live without my seam ripper; I love your quilt. Thank you for a chance to win Jacquelynne's fabulous digital e-book and your very nice giveaway. Super cute. Love your blocks...I have never tried the clover ripper...My favorite tools are blue painters tape and a adhesive lint roller...It is a breeze to clean up my mess with the lint roller especially after ripping out. It gets all; those crazy little pesky threads. The blue painters tape makes zippers a breeze to insert. No need to pin just tape into place. then rip the tape off afterwards. It's so simple, yet so vital--my rotary cutter! My favorite new quilting tool is the Pilot Frixion erasable pen. The heat of the iron just takes the marks away. I love the way your quilt turned out so far. It's so bright and cheerful it just makes you smile. I think my favorite tool is my stiletto. It's kept my fingers out the the path of the needle so many times. The seam ripper is a close friend of mine, but I could also not live without my rotary cutter and self-healing mat. My favourite tool is my rotary cutter. Your quilt is beautiful. Thank you for the chance to win. Such happy, fun fabrics. Thanks for the chance to win! Shahann at yahoo dot com. I can't believe after more than 4 decades of sewing that I just learned what that little ball is for on the seam ripper. Doh! I like the setting you used with your blocks, that made a nice quilt. Thanks for the video. My favorite tool is my Tru Cut rotary cutter and ruler system. I love how bright and cheery your blocks are! The hourglass blocks are an inspired addition. Wow! that must have sucked to find out you pieced the center wrong way.Bobbin always runs out at the wrong time. Glad you were able to get it all back together. If you didn't point out, I wouldn't have noticed ;). lol. Love how you changed positioning too... & made it Perfect! Great job! My bobbin must be related to yours...does the same thing! lol My favorite tool (besides the Ripper...grrr) HAS to be my Rotary Cutter for sure! Such a pretty quilt and the work involved! Thanks for the chance to win. Beautiful quilt! My favorite tool is my small scissors. I use it all the time. Gorgeous quilt.....I love the colors!! My favorite gadget is my Clover Wonder Clips...I use them all the time!! Love the flowers and butterfly. Just adds a bit of fancy flair! 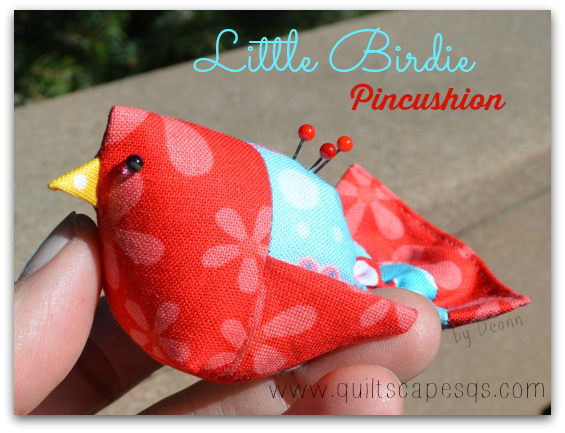 I share your love of a good seam ripper. Sad but true that some work has to be undone to be done right! I love the bright colors, beautiful! I'm glad to know I'm not the only one who seems to have everything frustrating happen at once! I've been having some problems with my wrist, so I just got a Sizzix. I don't know how I did without it! Thank you for the giveaway opportunities. 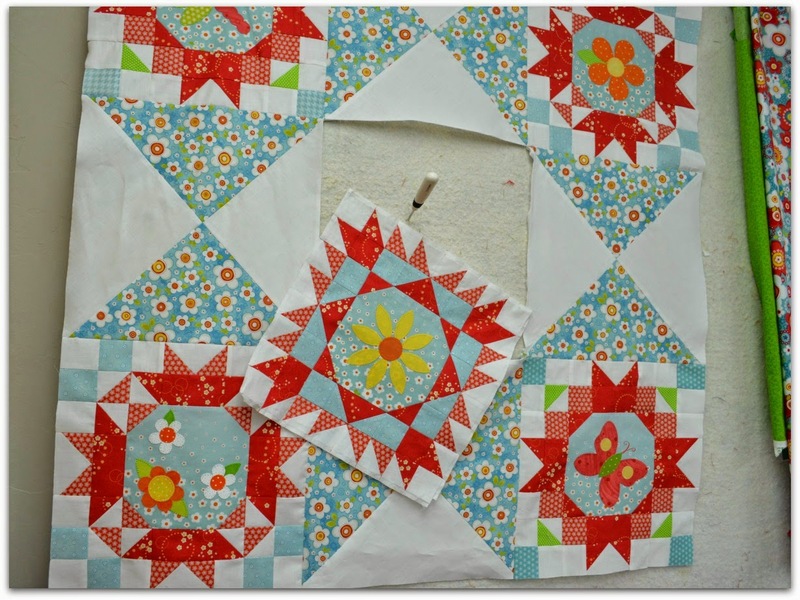 Your quilt is fantastic - my favourite - I love the way you set your blocks to make the large star. Your orphan block will make an adorable wall hanging and I would love to win it. My favourite quilting tool is the 16" square ruler for squaring up quilt corners or making sure that they are square. My rotary cutters are my favorite but my seam ripper is a close second. I need one of those Elite rippers in the video. Great pattern and fabric. I bought a cute daisy stitch cutter to take on holiday that was aeroplane friendly. It meant I could cross stitch as we flew across the Atlantic. Beautiful quilt!! I love those colours too! I'd have to say that the rotary cutter is my favorite tool. Beautiful quilt! Mine is on hold I as I don't like my colour choices. I like my seam ripper and rotary cutter. Love what you did with your blocks! My favorite tool is my rotary cutter--I can't imagine making a quilt without it. Not too fond of my seam ripper--a necessary evil in my mind--used much more often than I'd like! My favorite tool is probably my rulers - I have a ton of them. Seems like things work out better when I square up and measure accurately! My favourite tools are my wonder clips. I love them. 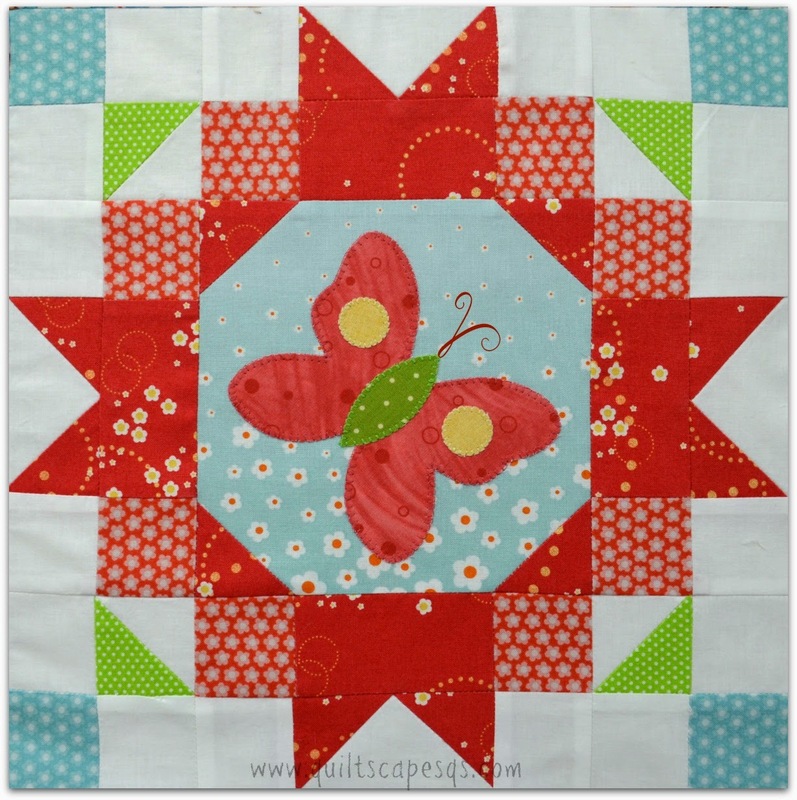 The butterfly is so sweet, I love the little flowers too, it's a lovely quilt. Cute quilt..love the colors!! 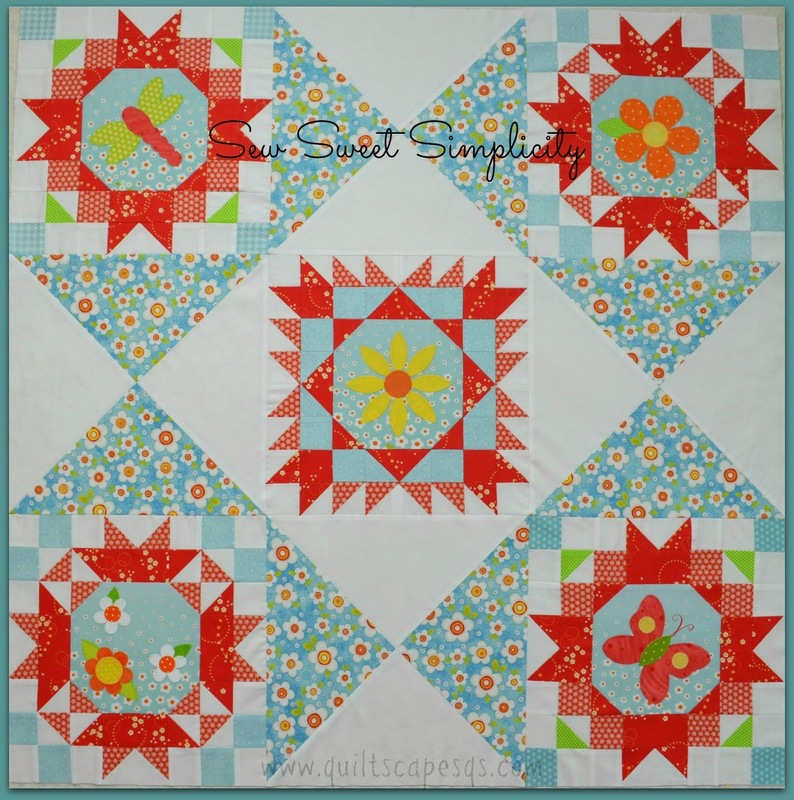 My favorite tool is my Accuquilt…makes it so easy to cut lots of the same size strips or blocks. I'm a beginner so my seam ripper gets used often, not necessarily my favorite but quite useful. 😁. Just a a loc block ruler and love it. I have to confess, I had a seam ripper but didn't use it for years. Then something happened when I turned 40 and it seems like I use it way tooo often now! The quilt is just too cute! Love the red/turquoise! HI,this is timely my seam ripper is now more>broken! Thanks for sharing your neat project>so pretty! Thanks,too, for a sweet giveaway! That looks wonderful - so happy and cute. My favorite tool is my rotary cutter. I must need a new seam ripper as can not rip out my seams like that. I have been know to cut the fabric, especially if I go faster than a turtle. Beautiful quilt! I have 2 favorite quilting tools. The first is my rotary cutter. I hate using scissors and the rotary cutter is so quick. My second favorite are my quilting rulers. I live all the different sizes and finding the right one for your project. Thanks for the chance to win! I couldn't live without my rotary cutter but have made use of a seam ripper a lot more than I would like lately. I have enjoyed looking at the different ways these blocks have been used. I am not sure yet how I will complete them, I love the fabrics you used. My absolute favorite sewing tool is my rotary cutter. I started sewing and quilting back in the olden times before rotary cutters. It was impossible to cut layers of fabric accurately so every piece had to be cut individually. Rotary cutting completely changed the quilting world. Thanks so much for the chance to win. My favorite is the Supreme Slider. Quilts just glide over it. I also use my 4.5" ruler several times while piecing. I love your quilt and colors. Thanks for the chance to win. My Gingher rotary cutter is my favorite too, but I have an electric shaver tool for ripping out seams that I really like, too. Love the fabrics you used in your quilt. My favorite tool? So many to choose from down in my lair, but I think the rotary cutter makes a lot of work simpler. Having good eyesight helps too. Love the colors in this quilt! My favorite tool is the computer because it has given me so much information to further my quilting skills! Thanks for the chance to win. Fabulous - I love the colours you used! My favourite tool is my awl ! Your quilt is looking fabulous, Deonn. Isn't it annoying when you sewing blocks the wrong way! Thanks for the lovely giveaway. Your quilt is delightful! I love your fabric choices. My favorite tool is my rotary cutter. Thanks for sharing your work, and thanks for the great giveaway. 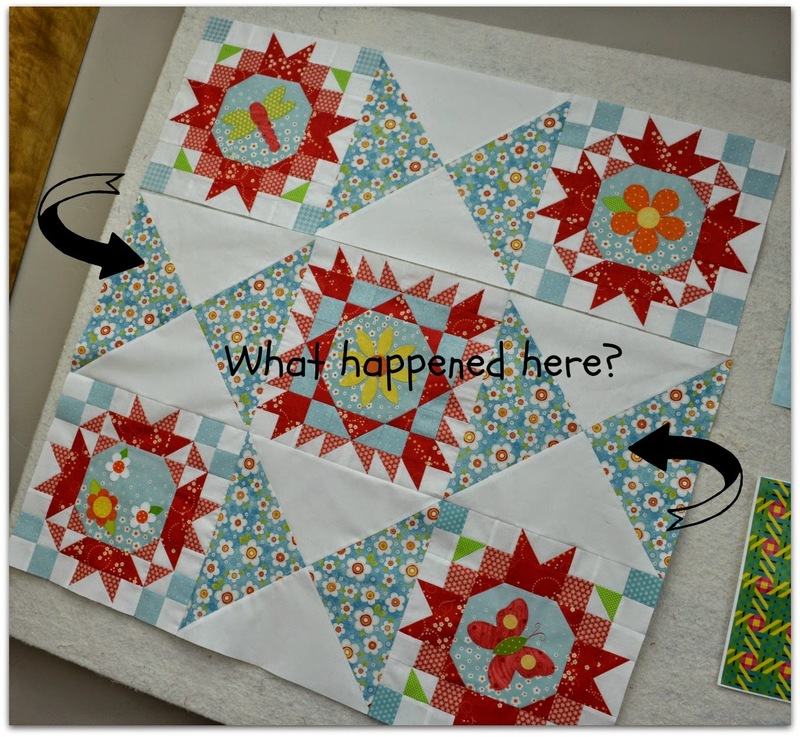 I love the idea of having a block made by another quilter! Your quilt turned out beautiful and it has been fun to see each block along the way. My favorite tool will always be my rotary cutter. I can't even imagine having to cut each block out with scissors. Actually years ago that was one of the things that stopped me from taking up quilting as I got tired of cutting each block out one at a time. I really dislike having to use a seam rippper but thank you so much for the video because I actually have not ever used one correctly. Which goes to show there is always something new to learn. What a beautiful quilt top! I love the fabrics you chose. My favorite tool would have to be my vintage Singer 15-91 sewing machine. She is such a joy to sew with. Thanks for the giveaway and the chance to win! My newest favorite tool is a quilting ruler to use with my Innova! Thanks for the opportunity to win. My favorite tool is my new seam ripper/stilleto. It is wood and has a tool in each end. 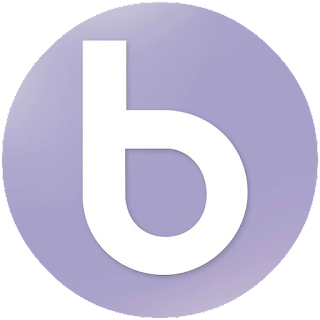 It is so easy to use and unfortunately I use it a lot!! Your colors are beautiful together. I love ALL the new gadgets that they have for quilting nowadays and have way too many of them :) every time I see a new one, I have to try it out. My favorite quilting tool is my rotary cutter. I have been quilting when using scissor and card board templates was de rigeur. Beautiful quilt and fabrics Deonn! I had to laugh as I don't ever sew without my seam ripper handy......in fact I have several! My favorite would be my rotary cutter....when it's sharp! i bet the birds are sleeping under the lovely quilt.